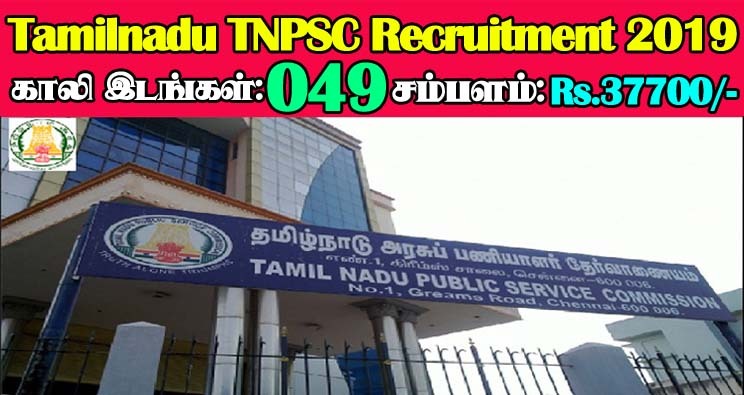 TNPSC Recruitment 2019 - TNPSC invites Online applications for recruitment of 49 Drugs Inspector, Junior Analyst in the Drugs Testing Laboratory Posts. This online facility will be available in the Official website www.tnpsc.gov.in from 12.04.2019 to 12.05.2019. Prospective candidates will have to apply online after carefully reading the detailed advertisement regarding the process of examination, eligibility criteria, online registration processes, application fee/ intimation charges, pattern of examination, Syllabus, How to Apply, Question Paper, issuance of admit cards/call letters, Exam Date, Result Date etc. and ensure that they fulfill the stipulated criteria and follow the prescribed processes. Note: (i) The qualification prescribed for the posts should have been obtained by passing the required qualification in the following order of studies: 10th + HSC or its equivalent + Bachelor‟s degree + Post-graduate degree as required under Section 25 of the Tamil Nadu Government Servants (Conditions of Service) Act, 2016. Results of the examination should have been declared on or before the date of notification. SCs, SC(A)s, STs, MBCs/ DCs, BC(OBCM)s, BCMs and Destitute Widows of all castes. Note: “Others” [i.e Applicants not belonging to SCs, SC(A)s, STs, MBCs/DCs, BC(OBCM)s, BCMs] who have put in five years and more of service in the State/Central Government are not eligible even if they are within the age limit. For One Time Registration (Revised with effect from 01.03.2017 vide G.O. (Ms).No.32, Personnel and Administrative Reforms (M) Department, dated 01.03.2017). Applicants who have already registered in One Time Registration system within the validity period of 5 years are exempted. iii) For candidates who are applying for both the posts of Drugs Inspector and Junior Analyst. The Examination fee should be paid at the time of submitting the online application for this recruitment if they are not eligible for the concession noted below. (ii) Applicants who had already registered under one time registration system by paying Rs.50/- before 01.03.2017 and having validity are exempted from paying the registration fee for this recruitment. Examination fee of Rs.150/- (Rupees One hundred and fifty only) or Rs.200/- (Rupees Two hundred only), as the case may be, is payable online through Net Banking / Credit card / Debit card or it can be paid offline at the State Bank of India / Indian Bank within two days from the date of submission of online application by choosing the option in the online application. (i) The three / two free chances referred to above are not for EACH POST but for ANY THREE / TWO APPLICATIONS ONLY. The claim for exemption from payment of examination fee made in any application, which has been rejected/admitted or withdrawn will be counted as free chance availed. (ii) Failure to pay the prescribed Examination fee along with the application in time will be liable for rejection of application. (iii) The number of free chances availed by the applicant means, the total number of free chances hitherto availed by the applicant in his/her earlier application submitted to the Commission for any post/recruitment. Eligible candidates can apply online through the Official website www.tnpsc.gov.in from 12.04.2019 to 12.05.2019. Before applying, Candidates should ensure that they fulfill the eligibility criteria as per published in the online advertisement.